Audit the IRS...or Shut It Down! Scandal after scandal after scandal. Benghazi, AP wiretapping, and the presidential administration using the IRS to target his political opponents. Not to mention the new revelation that the government has been spying on Americans on a day-to-day basis. WHAT? Wait, I thought this was America, you know, land of the free and home of the brave. Well there are a few brave souls left. Those regular citizens just like you and me who aren't afraid to take a stand when they see their freedoms being yanked out from underneath them, that's who I consider brave. 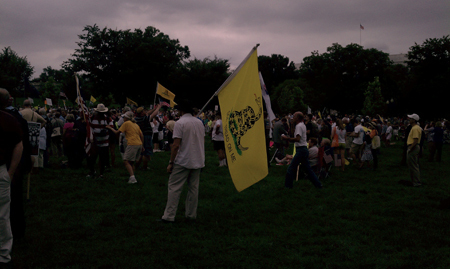 I guess you could consider myself and two of my other cohorts brave by not only going to the Audit the IRS Rally, but also by speaking out against the aforementioned tactics on the west lawn of the Capitol building in Washington, D.C. Now, I have mentioned in a previous blog that I have not only participated in past tea party protests, but I also helped coordinate a few rallies, and I was president of Katy Tea Party Patriots. It was a bit different this time, to actually be on stage behind the microphone sharing our story with many other citizens like ourselves. It was almost like a culmination of all of our joint activities and efforts and now we were the energizers of the movement not just the roadies behind the scenes. Not sure which role I like best. Ha! I have mentioned my two other cohorts, but I'm sure they won't mind if I introduce them by name, the NSA and the DHS already knows who they are anyway. One of the two troublemakers is Darcy Kahrhoff, also a past president of Katy Tea Party Patriots and my best friend. We met through the tea party movement in 2009 and we've been inseparable since. The other is Paul Simpson, Katy Tea Party Patriot's legal representation, aka subhuman, or better known as lawyer. That's a joke, people. Paul is also a very good friend of mine and we also met through political involvement, though his involvement started way before I was born. Sorry, Paul, couldn't resist. It's really all Paul's fault that we were flown there in the first place. If he hadn't written this article for Big Jolly, I don't think our story would have ever come to light. So, hat's off to ya, Paul! There were thousands of patriots in the audience, and we were grateful to be there, again standing shoulder to shoulder to uphold the freedoms of our country and to speak out against the bullying tactics of the IRS. The list of speakers was impressive as well. Glenn Beck, Michele Bachmann, Senators Rand Paul, Mike Lee, and my personal favorite, Ted Cruz. "Well, it's been one hundred years that we've had the current United States tax code. Don't you think that 100 years of oppression is enough?" - Michele Bachmann. Yes, Congresswoman, I do. To a cheering crowd of patriots, Senator Rand Paul said, "Anybody want to fire some IRS agents? Why don't we start with the 16,000 IRS agents that are going to implement Obamacare?" Nobody there could argue with that sentiment. Good on ya, Senator Paul! Senator Mike Lee also had some wisdom to impart to the group of liberty lovers. He said, "Governments, especially big governments inevitably go bad, they become tyrants when they become too big and too powerful." I concur. And last but not least, Senator Cruz had these words to fire up the crowd, "God bless the Tea Party!" Amen. He continued on to say that "[t]here is nothing more encouraging than millions of Americans all across this country standing up for liberty, standing up for the free markets, and standing up for the Constitution." We were in good company and there was no lack of patriots for sure. This investigation isn't over and the reason I'm writing this even two weeks after we went is because we can't let this die. In fact, in an effort to keep this fresh in the minds of Americans and Washington, Senator Cruz held a press conference this past Monday here in Houston to a packed house of patriots and a few Tea Party leaders from groups all over the state of Texas who had endured similar bullying tactics by the IRS. At the press conference, Senator Cruz began by quoting Thomas Jefferson, "When the people fear their government, there is tyranny; when the government fears the people, there is liberty." HOUSTON, TX — U.S. Senator Ted Cruz (R-TX) today called for fundamental tax reform in order to abolish the IRS and put an end to its abuse of everyday American citizens. He urged Texans who believe they may have been targeted by the IRS to email irstarget@cruz.senate.gov. "IRS targeting of American citizens is a threat and challenge, but also an inspiration," said Cruz. "It is an inspiration that these leaders are standing up. It is a threat that the federal government is targeting, not big corporations or lobbyists, but normal American citizens that are standing up for liberty. It is a challenge that we all face to limit the power of Washington." Indeed, that's what started the Tea Party, a desire to limit the power of Washington, and our fight to do so is far from over.